Few people know that Christmas is popular even under the sea. Mermaids wear festive hats just for the occasion! Many years, I create an ornament that shows whatever is enchanting my kids that year. 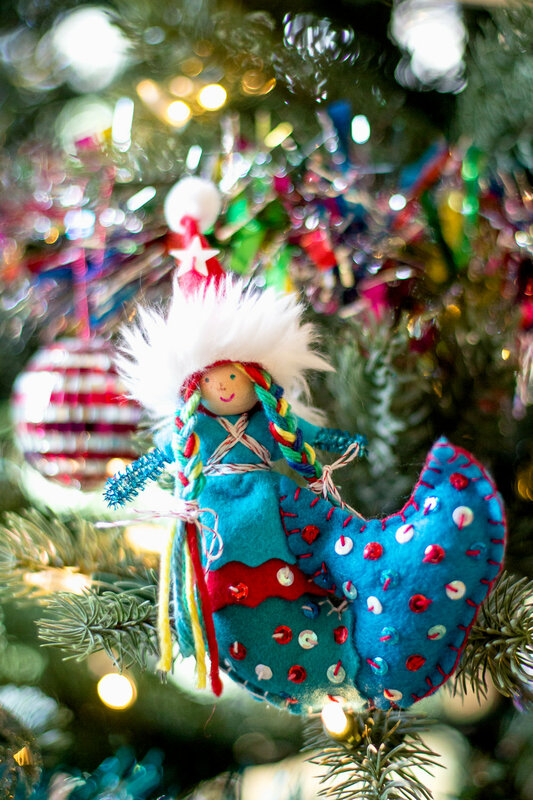 From the Orange Fairy when my son was obsessed with all things Orange, to the Peppermint Fairy from the year my daughter danced as a Peppermint in our local Nutcracker ballet, the ornaments are fun to make, and even more fun to remember. Helping kids make fairies is fun. However, anytime I help them, I take the back-seat in order to support their ideas and choices. So giving myself room to create any fairy that I want is tremendous freedom. My daughter has a (slight) mermaid obsession. We included mermaids in the Forest Fairy Craft book. They were summer mermaids with crowns. How could I modify the mermaid for the holidays? I wanted a tail that curved, which took finagling. A few trial and error attempts where it looked too bulky or gigantic. I always draw pieces on paper first to cut out and test shapes. Then I use test felt (inexpensive felt in any color) which I can sew together with a few little stitches to see if the scale works. Once it does, time to create! Both my daughter and nice love turquoise, so I used that as an inspiration color for both mermaids. Using just a wee strip of faux fur on their hat was a fun carryover from other fairies that I was working on at the time (Saint Nicholaus). The Faux Fur is a little tricky to sew, hard to get the needle through, so it's definitely an adult quest. You could create a similar look with a strip of white felt. I also use metallic thread similar to this one for that added sparkle. It's tricky to sew with the thread so it winds around their outfit. The girls loved their mermaids! And it's a joy to see them again year after year. Happy creating, one and all!